I JUST WANT TO PEE ALONE Book Signing Event during Westfield, NJ’s annual Girls’ Night Out was a big success! 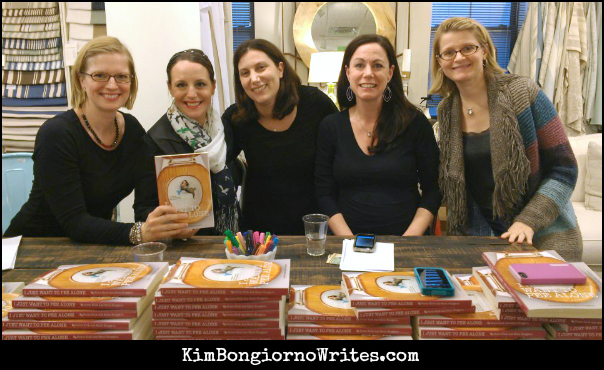 On Thursday, April 18th 2013 from 5-9pm, 5 of us co-authors of I JUST WANT TO PEE ALONE welcomed ladies from all over NJ at The Farmhouse Store to mix and mingle over wine and stacks of paperbacks. Lots of books were sold for Mother’s Day gifts, baby shower gifts, birthdays, and personal keepsakes. We even had a fabulous stock of Sharpies in a “Glam 80s” variety pack at the ready to personalize our signatures on copies for all who came by to say Hi. A receptive audience laughed and clapped as we read essays and blog posts about taking our families out to dinner, calming crying babies, nemeses bunnies, and more. One highlight of the evening was when I gave a friendly warning to the audience that some of the language in the readings might not be for those young of age or faint of heart. One mom popped over and asked me to whisper the words in question. Upon hearing my reply (hint: they rhyme with “sock” and “truck”), she shouted to her husband “Quick! Take the kids outside for ice cream right now!” causing a case of the giggles for the table of authors. More book signing events are currently in the works for New Jersey and around the country, so if you are interested in meeting some of the co-authors near you, please let me know so I can pass the request along. Thanks to The Farmhouse Store for being so welcoming and wonderful, the town of Westfield, NJ for organizing a great downtown event for the ladies, and to all the amazing fans – new and old – that came to support us all. More photos available on the event’s Facebook Page. If you attended, we encourage you to add your own photos there, too! Previous NJ BOOK SIGNING: Update! Next New Book Signing Event: Brattleboro, VT! That’s a whole lotta funny in one room! Congrats, ladies!!! You deserve all the success and fun–LIVE IT UP! Had such a great time, thank you for making it happen!